They really didn't know what to expect when three "ordinary people" from Ladenburg, Germany, started some sort of a research project concerning the history and fate of the Progressive Rock Bands in the part of Germany where they live, and had been listening to when they were 25 years younger. Claus Hessenthaler, treasurer of the City of Ladenburg - 12000 inhabitants - in his main profession, Thomas Pindris, quality manager for an international shipping agency, and Petra Gebuhr, secretary, simply started to search for telephone numbers and email addresses of former musicians and band managers, collectable records, and articles in music magazines of the early Seventies. As younger brothers of two band members of Twenty Sixty Six And Then were classmates of the two guys in the trio, the whole thing soon became connected with their youth and life history in a quite unique and personal way. When they had the plan for an exhibition of records, instruments, clothing and memories of witnesses of that period, and - maybe, if it would work - a concert of former members of some of the bands to be presented in the exhibition, they talked with Andreas Huben, another classmate. He is the owner of a tree nursery and an almost empty former factory building, and he is experienced as an organizer of Jazz and Folk concerts. They soon agreed that the exhibition could be installed in an empty factory hall and that there could be an open air concert in the factory yard. The title for the project they chose was "The Progressive Seventies. Rock in the Rhine/Neckar River Triangle". At this moment, the whole thing still was a personal passion of four people with only local relevance. As soon as the protagonists started their project, they had to learn that there was a broad interest in their work. Most of the musicians immediately agreed to contribute items to the exhibition or at least help with information, research or contacts. What they didn't expect, was that some bands had to be sorted out, among them Krautrock celebrities as Message and Guru Guru who also resided in that area of Germany during their careers. As the material grew and grew and kept growing, the project concentrated on four bands based in Mannheim, the informal capital of the region. These bands - Nine Days' Wonder, Kin Ping Meh, Twenty Sixty Six And Then and Tritonus - were the personal favorites of the project makers, but on the other hand their members knew each other personally, played together in concerts and mutually supported each other in recording sessions. These musicians formed a scene within the scene of the area. So this decision also made sense "objectively". And the old pals' partnership still worked. The musicians liked the idea to go on stage again and were looking for appropriate lineups as some of their former band mates have retired from playing music and others had died in the meantime or simply lost contact during the years. 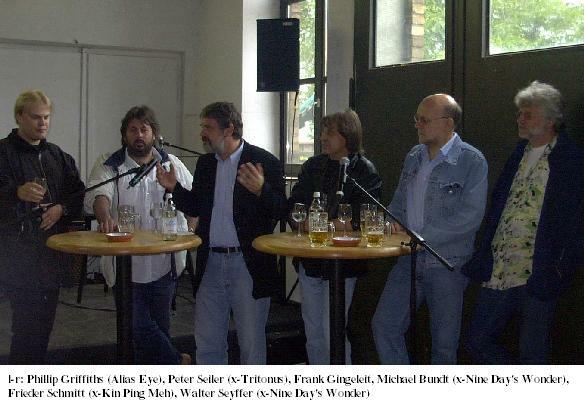 An informal head of three "musical directors" was born: Frieder Schmitt, Ex-Kin Ping Meh, Freddie Münster, Ex-Nine Days' Wonder, and Steve Robinson, Ex-Twenty Sixty Six And Then, organized rehearsals, wrote partly new arrangements, and prepared recordings for musicians who live further away and could not regularly rehearse with the bands. For a long period it was not quite clear what really would happen on stage, but a date was appointed and everybody was quite sure that there would be a concert. In the meantime the exhibition grew. There were talks and visits and conferences to collect, debate, dates and validate the findings. And the time was used for the technical aspects of any exhibition, how to group the items, how to present them, finding frames for the concert posters, showcases for rare records and instruments, manequins for the presentation of the contemporary fashion... And this was also the time when I got involved in the project. A former interview partner gave my telephone number to a member of the project group. 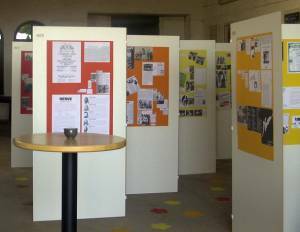 I was asked to write the text for an information sheet for visitors of the exhibition and to conduct a discussion group of several former members of the bands to be presented on the last day of the exhibition. The text of the information sheet should also give an overview of the time and the music of the early Seventies, the local aspects being "embedded". Later they came up with the idea that I should also lead through the program during the planned concert. This was in March, and from then on I was in the role of a "participant observer", on one hand a contributor to the project, and a journalist reporting about the project on the other. But these two roles were quite easy to get along with as there were several groups of people working independently when the project took breath to reach the home stretch. In May the local press started a series of continuous reports about the project, announcing it as the local "event of the year" regarding the expected concert as well as the exhibition. The pre-sales of concert tickets soon led to expections of a financial break even, which was quite important in two respects. It was private money of the project group that had to pay for each single nail used for the exhibition, as well as for the stage for the concert. And the project was taken even more seriously by all participants so that this work of volunteers lost any air of amateurism. The exhibition opened on the evening of Friday, July 5th, for an audience of invited guests, among them musicians, the persons who contributed to the project, local public figures and members of the press. The exhibition was presented in two different showrooms, one mainly used for the presentation of records, CD re-releases, instruments and contemporary fashion, the other one showing a clever arrangement of exhibition stands allowing a brief overview as well as the inspection of details. This room also showed concert announcements from the beginning in local clubs and hotel bars to tour posters when the bands had gained national and partly international reputation. In a certain sense the exhibition was complete. You could see fan and loveletters sent to the musicians in the Seventies, backstage passes, management orders when and where to show up for a concert, an interview or a presentation of a record, newspaper and magazine articles, private photographs, and all this was represented in two ways simultanously - you could either follow a bands way through the years, or you could follow the ray of time and see what happened with the bands. Due to the chosen means of representation the exibition was rich in its material, but not overloaded. The door of the former factory hall where the exhibition was presented was open that Friday night, and the visitors could hear the craftsmen work and see the stage grow outside... for next day's open air concert. It was a little cloudy the next morning and the weather forcasts were unsure as to whether it would be raining that day or not. The concert would have taken place in any weather as the stage had a roof, but as some hundred tickets were left the weather was a part of the success of the concert. During the sound checks in the afternoon the sun came out, the sky was still a bit cloudy but it turned out to be a nice summer evening when the concert started at 7:00 pm. 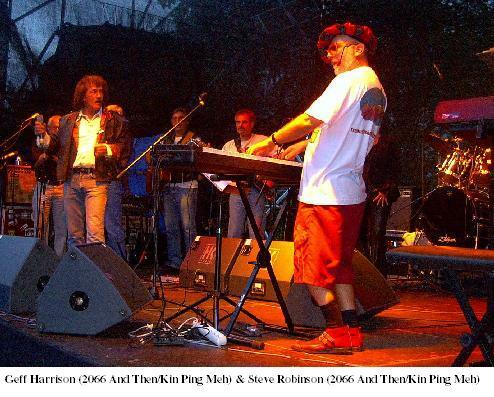 There were five bands on stage that night, beginning with Take Five, predecessors of Kin Ping Meh in the Sixties, one band performing tunes of Nine Days' Wonder and Twenty Sixty Six, formed of members of both bands and friends, two bands representing different periods of Kin Ping Meh, and Tritonus. Some of the bands used the sound check for last rehearsals, as some of them had never before rehearsed or played together in their complete actual line ups. But already during the sound checks it was clear that something special would happen that night. In the briefing right before the concert started I was asked to emphasize in my announcement that some of the musicians had not even seen each other for about thirty years, that it was a fun project to play together again, that nobody should expect a real professional show etc. But I knew it better, and I was right. Take Five started with a four piece set of cover versions of tunes by Chicago, Blood, Sweat & Tears and the like, as they did in the Sixties, when this kind of music was preparing what later turned out to become Progressive Rock. This was a well done and appropriate "warm up", but it was Steve Robinson, Ex-Twenty Sixty Six And Then, who set the records straight. From the first tone of his set with members of Nine Days' Wonder and his own former band mates it was clear for everybody, for the audience as well as for the musicians on stage and those to follow later with their sets, that this evening was not only fun. All members of that line up were playing for their lives, biographically speaking. They started with sophisticated tunes from the early Nine Days' Wonder albums and later led over to the tunes of Twenty Sixty Six with Geff Harrison, their original lead singer, on vocals. Some of the tunes were re-arranged, now coming with saxophone and trumpet solos and female backing vocals. And this turned out to be - progressive! This was not a nostalgic presentation of "ancient" musical pearls - there was a clear development, and it is said that the members of this new band are planning to continue to play together. The exhibiton closed a week later on Sunday, July 14th, with a public "talk show" in front of 200 visitors. There was no specific "goal" to reach with these talks, but Walter Seyffer, Michael Bund (both Ex-Nine Days'Wonder), Fieder Schmitt, Uli Groß (both Ex-Kin-Ping Meh), and Peter Seiler (Ex-Tritonus) took the opportunity to reflect and debate the social and political climate of the Seventies as a framework for the music of that time, what "progressive" meant for them then and today, the economic situation as musicians in that time period and the role of the music industry in relation to the German Rock Music of the Seventies. With them was 25 years old Philip Griffiths, son of Martin Griffiths, who is carrying on Progressive Rock with his band Alias Eye. It was soon clear that all of the elders had been affected by the political and social eruptions of the Seventies, but there was a decisive difference: There was the provocative and avantgardistic approach of Nine Days' Wonder and there was the orientation toward success of Kin Ping Meh. But everybody agreed with Walter Seyffers statement, that in general their bands lived what the played. 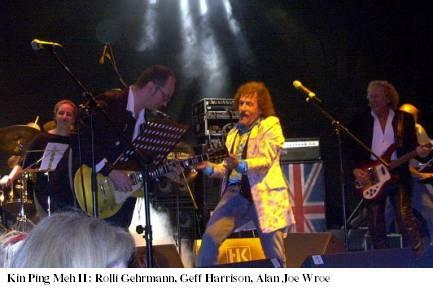 One could still feel the frustration of Uli Groß, composer or co-composer of many tracks on Kin Ping Meh's second album, when he talked about the stubbornness and the musical prejudices of influential managers of the music industry ("They tried to tell me that you could not use an accousic guitar in a Rock song"). For Philip Griffith his music has no political or "revolutionary" impact. He likes complex musical structures, unusual instrumentations and well composed melodies. And he frankly admitted that some of the new Progressive Rock Bands like Dream Theatre or Spock's Beard are somewhat backwarded, if not even "regressive". All members of the discussion group agreed that there are still chances and perspectives for young musicians presenting experimental and unconventional tunes if they really do their own thing. "Sooner or later quality will prevail", as Michael Bundt put it.